Search Results for "circus big top"
KIEV, UKRAINE - JUNE 26, 2014: Acrobatic show in the circus. Performance in a circus tent during an international circus festival in Kiev. KIEV, UKRAINE - JUNE 26, 2014: Two women perform gymnastic show on the chairs in the circus. Performance in a circus tent during an international circus festival in Kiev. KIEV, UKRAINE - JUNE 26, 2014: Children and their parents applauded circus artists. Performance in a circus tent during an international circus festival in Kiev. KIEV, UKRAINE - JUNE 26, 2014: Circus juggler on stage. Performance in a circus tent during an international circus festival in Kiev. KIEV, UKRAINE - JUNE 26, 2014: Circus performer juggling balls with his mouth. Performance in a circus tent during an international circus festival in Kiev. KIEV, UKRAINE - JUNE 26, 2014: Circus performers go on stage and greet the audience. Performance in a circus tent during an international circus festival in Kiev. KIEV, UKRAINE - JUNE 26, 2014: Couple aerialists circling on the ropes under the big top. 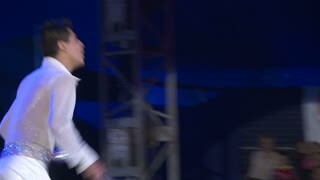 Performance in a circus tent during an international circus festival in Kiev. KIEV, UKRAINE - JUNE 26, 2014: Aerialists fly under the big top. Performance in a circus tent during an international circus festival in Kiev. KIEV, UKRAINE - JUNE 26, 2014: Shadow on the curtain. Two women acrobat whirl under the big top. Performance in a circus tent during an international circus festival in Kiev. KIEV, UKRAINE - JUNE 26, 2014: Male dance in the circus tent. Performance in a circus tent during an international circus festival in Kiev. KIEV, UKRAINE - JUNE 26, 2014: Show clowns in the circus tent. Performance in a circus tent during an international circus festival in Kiev. KIEV, UKRAINE - JUNE 26, 2014: Jugglers on stage circus tent. Performance in a circus tent during an international circus festival in Kiev. 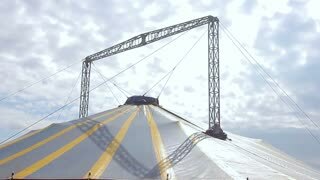 1930�s footage of unloading circus cargo and pitching a circus tent. UNITED STATES 1950s : On the way to the big top where the circus is held, people pass by a menagerie tent with many sights and sounds. KIEV, UKRAINE - JUNE 26, 2014: Acrobatic show on the pole. Shadow on the curtain. Performance in a circus tent during an international circus festival in Kiev. KIEV, UKRAINE - JUNE 26, 2014: Two girls perform acrobatics show on the stripper pole. Performance in a circus tent during an international circus festival in Kiev. UNITED STATES 1950s: View of crowd at circus, Firestone factory in background / Pan from crowd to circus tent. UNITED STATES: 1940s: Performer high up on circus tent platform. 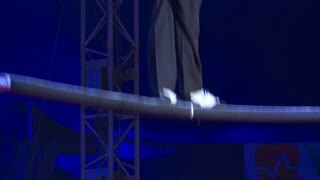 Man grabs trapeze. Close up of circus performer as he prepares for stunt. Cartoon controller inside man's head. A 1940's circus comes to town, and the elephants help to pitch the colossal circus tent. Circus Artist couple duo men and women train a body lift. 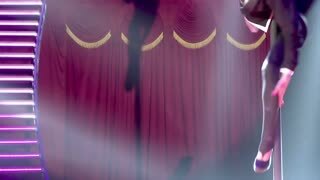 Men swings girl around his body in circus tent.